ActiveWorlds Gate 5.0 launched on November the 26th 2009, in readiness for the launch of ActiveWorlds 5.0 on December the 1st 2009. This gate is radically different from all that came before. Traditionally, the gate is an island, surrounded by water, an explanation for its small size by the island status. For version 5, they went with something a little different. 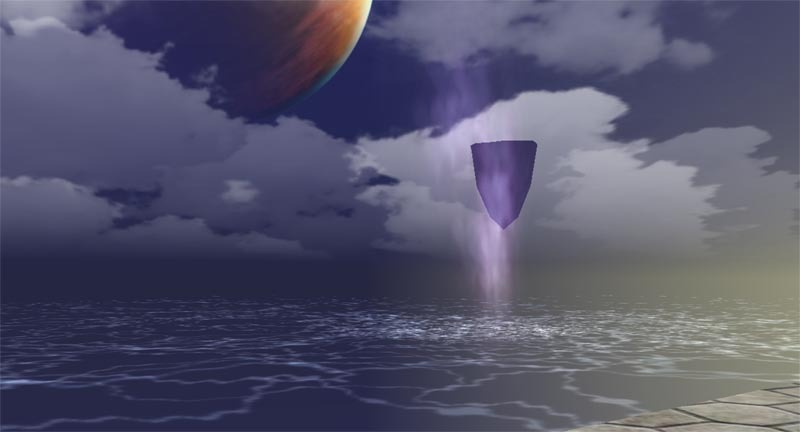 This version of the gate is a laputa, a flying island in an eternal sea of sky. There is no land to speak of, no terrain. At the edge of the island is an abyss plummeting down forever - well for a full kilometre anyhow. Also new is the forcefielfd preventing anyone from stepping off. A feature of other, less expansive worlds with lesser technology, the creators of this new entrance world have decided to artificially create such a limitation here, where there never was one before. Perhaps the reason for that is in the other laputa sharing the sky with the gate. Symbolically they represent the other worlds of the ActiveWorlds platform, each a separate kingdom (or Queendom) to itself. If you could fly over to them, it would spoil the illusion of them being just out of reach. In the screenshot, we can see part of one of those islands in the distance there, with a planet visible in the sky above. That is not water gushing forwards there, but a plume of energy, a ribbon of ether, deciding to explode at that point. It ripples outwards like waves on air, and is gone, only to descend a little later, somewhere else. All in all a quiet scene for contemplation, echoing the silent power of the platform in an understated way.